Our ethos is that improving engagement and collaboration between researchers, conservation practitioners in the international and local NGO sectors, policy makers and influencers as well as related businesses will help to create and implement more effective and impactful strategies and interventions on the ground, informed by scientific research. This will help to bridge the widely recognised mismatch between academic research and conservation practice for issues surrounding the illegal and unsustainable wildlife trade. Conservation organisations contain many highly skilled individuals who have substantial experience in implementing conservation on the ground, and often have collected excellent datasets which could contribute to the academic evidence base on policy effectiveness. However, often they do not have the time, technical skills or academic environment within which to write these datasets up for publication, nor exposure to academics which can help ground theory in practice. The programme offers such individuals (or other academics) the chance to spend up to 3 months with our core research team as well as our affiliated Interdisciplinary Centre for Conservation Science group at the University of Oxford to enable and develop collaborative publications, ideas or proposals. The Fellow will be encouraged to take part in a range of valuable interactions with other academic colleagues, students (undergraduate and post-graduate) and potential donors. Visiting Fellows will be encouraged to take part in and contribute to current or upcoming engagement initiatives, workshops or events, such as Trading Ideas or our annual Wildlife Trade Symposia. I am broadly interested in the sustainable use of Colombia’s unique biodiversity contributing towards economic and societal welfare of the country. My research aims to help preserve orchids of the Colombian Andes and their ecosystems by involving local communities in creating in-situ and ex-situ conservation strategies and by offering them an alternative mode of subsistence through legal orchid cultivation and commerce. I want to help transferring valuable knowledge from hobbyists to the local communities. We are creating a great partnership between collectors, communities and scientists to protect orchids. Orchids are flagship species that can help to promote the conservation of the entire Andean forests and its ecosystem services. Colombia has the highest number of endemic orchids in the world, approximately 4,300 species of the Orchidaceae family representing about 15% of the total orchid species globally. Although all orchids are currently included in Appendices I and II of CITES, commercial collection and illegal trade aggravate pre-existing population declines. Many orchid species are endemic to small regions, and as a consequence they are threatened due to rapid habitat loss and/or poaching. Since 2017, we have been working with the Colombian Orchid Society (SCO). Our main goals are to promote the study, culture, and conservation of orchids. Although SCO members have outstanding live collections, and experience with in-vitro cultivation and horticulture, they have also contributed to the indiscriminate extraction of orchid species and the loss of orchids’ germplasm. Because of the demand of wild and rare orchid species by hobbyists, the rural communities (campesinos) find wildlife represents a relatively easy way of earning disposable income. As a visiting researcher at the ICCS through the Oxford Martin Programme on the Illegal Wildlife Trade, I am addressing some of the drivers of the illicit orchid trade in Colombia. I believe private collectors (hobbyists) should begin to be recognized as a solution rather than a problem for orchid conservation nationally. We have been working together on various scientific and social strategies to conserve orchids. To highlight some of those strategies, we are using live collections for scientific studies in endemic and diverse Colombian orchid groups by creating the first virtual herbarium for live collections. This herbarium will have two main purposes, to serve as a repository of botanic and genetic information, as well as aid in the eventual legalization of all digital collections. Recently, SCO acquired 200 hectares of land in Jardín, Antioquia. Today this is an established Natural Reserve of the civil society granted by the Colombian Ministry of Environment through the National System of Protected Areas. The reserve belongs to the 14,000 hectares of protected mountain rain forest, which is potentially the best-preserved forests of Antioquia. We are building a conservation area open to the general public that is involving local communities in horticulture and conservation. During my fellowship, I expect to learn different ways to incentivize rural communities to protect and/or sustainably manage Colombian orchid populations. Through the interaction with such an interdisciplinary group, my goal is to better understand threats in orchid conservation, and the role local communities and citizen science can play in preserving orchid diversity. Growing up in Hong Kong with constant exposure to a highly fast-paced, diverse and adaptive market, I have always carried a deep interest in pursuit of understanding wildlife consumption in different contexts, and the multifaceted nature of the consumer mind. I studied conservation and anthropology at DICE, and have also spent time working with Rare, Project Seahorse and GlobeScan, looking at trader and consumer behaviour, existent attitudes, and campaign effectiveness in promoting positive change towards sustainable use or demand reduction across different product types and international markets. I am currently based in Guangzhou in association with the Socio-Ecological and Conservation Science Lab at Sun Yat-sen University, conducting demand-side research in one of the largest hubs of domestic and cross-border trade for wildlife products in China. My current research involves filling knowledge gaps on the extent and scale of online market demand for multiple illegal wildlife products in China, particularly those used in traditional Chinese medicine, through better understanding of the trading landscape, diversity of product interest and nature of the domestic market. I am exploring the use of social scientific methodological approaches to identify consumer segments and measure heterogeneous consumer interests and habitual behaviour, to better understand the drivers and motivations behind wildlife purchases. Particular interests are in capturing underlying social attitudes, implicit intentions and diverse push and pull factors that may govern consumer decisions, especially those in relation to sensitive wildlife products. I am also reviewing evidence and looking at ways to optimize campaign designs that could strengthen relatability to wildlife consumers, and potentially catalyse and promote positive, long-term and voluntary shifts in wildlife consumption. Some of my work is part of current projects under the Oxford Martin Programme on the Illegal Wildlife Trade, and I am very excited and grateful for the chance to be involved and to spend time locally as a Visiting Fellow. Through this fellowship, I will be working mainly for the project on “Disentangling the legal and illegal markets for bear bile in China,” to pilot a consumer survey that maximizes capture in obtaining data on the profile, attitudes and habitual behaviour of bear bile consumers. I am also hoping to test new methods in attempt to capture social attitudes associated to the purchase of wild and farmed bear bile products, as well as obtain new insights on online market trends in China. In addition, I look forward to continuing progress and engaging in discussions with work for the project in “Exploring the effective use of celebrities in wildlife demand reduction: changing perception of pangolins in Vietnam,” reviewing evidence of campaigns with celebrities as promoters of behaviour change. 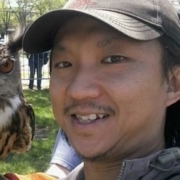 Ming is a trained conservation scientist and defended his PhD thesis at the University of California, San Diego, USA. He completed two fellowships from Columbia and Yale Universities (Earth Institute) and Princeton University (Woodrow Wilson School). Taking a break from academia, he worked as a data scientist in an educational technology company in New York City. Late 2017, he started a prestigious professorship position at the Department of Ecology and Evolution, School of Life Sciences at Sun Yat-sen University, China. His team takes interdisciplinary and novel approaches to address illegal wildlife trade and sustainability issues in China. Professor Edson Gandiwa is currently a Professor of Wildlife Conservation and Management, and Dean, School of Wildlife, Ecology and Conservation at Chinhoyi University of Technology, Zimbabwe. Previously, he served as an ecologist within the Zimbabwe Parks and Wildlife Management Authority based in Gonarezhou National Park. He has been involved in two assessments under the Intergovernmental Science-Policy Platform for Biodiversity and Ecosystem Services (IPBES). He has recently been involved as a community-based natural resource management expert in Zimbabwe’s Communal Areas Management Programme for Indigenous Resources (CAMPFIRE) review. He holds a BSc (Hons) in Environmental Science and Health from the National University of Science and Technology, Zimbabwe, an MSc in Tropical Resource Ecology from the University of Zimbabwe and a PhD in Wildlife Conservation and Management from Wageningen University and Research, the Netherlands. 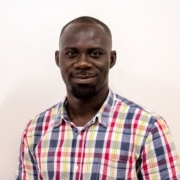 Kofi Amponsah-Mensah is an early career ecologist and conservationist, with a PhD from the University of Ghana. His research focused on the Ecology of fruit bats and their role in zoonotic disease transmission. 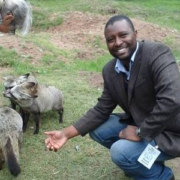 He has research experience in Bushmeat trade and exploitation issues, market survey techniques and has been involved in projects addressing trade dynamics and implications of bushmeat exploitation for disease transmissions. He has also been involved in research addressing human-bat interactions and disease spillover risks. Currently he is a Research Officer at the Centre for African Wetlands at the University of Ghana. 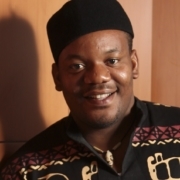 He is presently involved in a research exploring current bushmeat trade issues and market dynamics in Ghana, particularly, changes in bushmeat exploitation and trade in response to changing land use and the possible implications for species conservation and food security in Ghana. 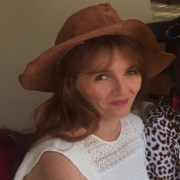 Dr Vivienne Williams is an ethnobiologist, ‘freelance academic’ and Senior Visiting Researcher in the School of Animal, Plant & Environmental Sciences (APES) at the University of the Witwatersrand (Johannesburg, South Africa), and a National Research Foundation (NRF) C1–rated researcher. Since she first stepped foot in a ‘muthi’ shop run by a sangoma in 1992, the key theme of her research has been wildlife trade (particularly the trade in plants and animals for traditional medicine purposes). She has undertaken applied multi-disciplinary research in traditional medicine markets and outlets across South and southern Africa. 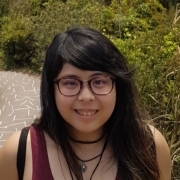 With students and collaborators, she has also investigated the trade in diverse taxa for traditional medicine across the continent – such as cycads, orchids, tree bark, birds, reptiles, pangolins and large carnivores including lion bones and their derivatives. Angelo Ramy Mandimbihasina works for Durrell Wildlife Conservation Trust Madagascar. 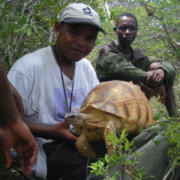 His research involves following the different effects of poaching on a very threatened species of Malagasy tortoise, the ploughshare tortoise, Astrochelys yniphora. Despite the high demand on the international pet trade and black market, wild populations are declining and exposed to a big risk of going extinct. To escape from the threat of extinction, it is crucial to know the decline rate, its effect on the gene pool and inbreeding; also we should predict when the population will go extinct in order to find alternate solution for its conservation. 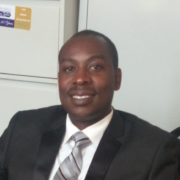 Dr. Medard Twinamatsiko is a Senior Researcher and Lecturer at Mbarara University of Science and Technology in the Department of Environment and Livelihood Support Systems with over 12 years of experience as a Development Conservationist. He has a PhD in Policy Management and Natural Resource Governance. He has previously implemented three Darwin Initiative projects and several other projects supported by Arcus Foundation, in the area of Natural Resource Governance. These projects were all aiming at linking conservation to community well-being. He brings expertise in community-based conservation approaches such as integration of governance and equity principles in natural resource management. 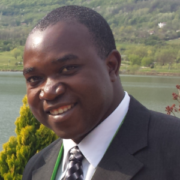 Dr Victor K. Muposhi worked as a Teaching Assistant from 2006 to 2009 in the Wildlife Unit of the Environmental Science Department, Bindura University of Science Education and is now an Assistant Professor in the Wildlife Ecology and Conservation Department at Chinhoyi University of Technology. 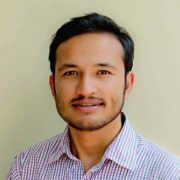 He is also staff development fellow for the Doctor of Philosophy in Conservation Biology. His research focuses on the molecular and ecological trade-offs of trophy hunting and their implications on conservation of wildlife species in Zimbabwe. I am a farmer, wildlife enthusiast, agricultural and biodiversity conservation community radio broadcaster. I hold a Bachelor of Arts in History and International Studies from Imo State University, Owerri, Nigeria and a Masters in International Development and Cooperation from the Institute for Advanced Studies of the University of Pavia, Italy. I use radio educational programs, to communicate latest agricultural science and biodiversity conservation trends, to enrich the knowledge of smallholder farmers in Nigeria. As Executive Director of The Smallholders Foundation, a rural development organization based in Imo State, South Eastern Region of Nigeria, our community radio station, the Smallholder Farmers Rural Radio (Farm 98.0 FM), is used to develop and broadcast 10 hours of daily agriculture, environmental and market information in the local Igbo Language to inform and improve the economic and environmental management capacity of local smallholder farmers. Over the past 15 years I’ve worked to increase agricultural development capacity by broadcasting content covering: crop production techniques, livestock management, seed accessibility, soil management practices, erosion and flood control techniques, farm management and safety, food safety, crop pest and livestock disease control, rainwater harvesting, treadle pumps making, small scale irrigation management. I also discuss topics relating to farmer health, nutrition, HIV/AIDS and malaria. Additionally, I share information on how to improve small farmers’ wider environment, including: alternatives to slash and burn agriculture, sustainable water management, enacting and enforcing laws to protect community streams and rivers, using drought-resistant plants, techniques to restore degraded rainforests, wetlands and mangrove ecosystem, sustainable fish harvesting technologies, planting multi-use trees, coping with extreme weather events, agro forestry, wildlife management, ecotourism, utilizing renewable energies, among others. I broadcast daily commodity prices from 38 major markets within the region, giving farmers information on how to access national and international markets, steps on exportation and accessing micro-credit facilities. 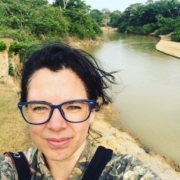 I am particularly excited to be a OMP-IWT Visiting Fellow because I’ve been looking for an academic stimulating environment, where I can interact with researchers to create and implement a new interdisciplinary approach to solve the contemporary challenge of illegal hunting and trade of pangolins in Nigeria. The aim of the project is to secure increased income for the local population in Ogun and Oyo states, South Western Nigeria, thereby reducing the need to generate income through illegal poaching of pangolins for local meat consumption and trade in scales. My project seeks to carefully select 100 hunters, farmers, Pangolin scales dealers, bush meat sellers, forest reserve workers and timber dealers from 53 local government areas of Ogun and Oyo states, Nigeria and train them in sustainable homestead Grasscutter (Greater Cane Rat, Thryonomys swinderianus) farming and marketing as a means of an alternative livelihood. As part of the project I will also produce and broadcast an 11-episode educational radio serial drama in the local Yoruba Language titled “Meet the Pangolin” to increase local knowledge about Pangolins and create public awareness about the Federal Republic of Nigeria’s Endangered Species Control of International Trade and Traffic (Amendment) Act, 2016. This absolutely prohibits the hunting or trading in wild animals, including pangolins (specified in the First Schedule). The educational radio serial drama will be aired on Ogun 90.5 FM Radio, Abeokuta and Premier 93.5 FM (FRCN), Ibadan, Oyo State, over a six-month period with a reach of at least 5 million listeners. Additionally, my project will establish an inter-agency Pangolin Monitoring Desk in Ogun and Oyo states, with representatives of the Nigerian Police Force, The Nigerian Customs Service, the Nigerian Environmental Standards Regulations and Enforcement Agency (NESREA), and the Nigerian Parks Authority, to enforce the Endangered Species Act, thereby controlling the illegal hunting and trade in pangolins. My goal is to build a long-term partnership with OMP -IWT. This partnership will continue the cross-fertilization of ideas and exchange of knowledge long after my fellowship ends which will be critical to refine and implement my project in Nigeria. 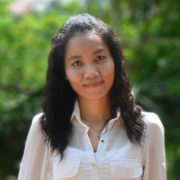 I am currently a Research Program Officer at Free the Bears (FtB), Cambodia. I completed my master degree in Biodiversity Conservation at the Royal University of Phnom Penh in 2015. My relevant experiences were about conducting both biological/ecological and social research in order to understand problems on biodiversity and wildlife, and throughout the research findings to provide the recommendations on wildlife conservation in my home country. In my roles with Free the Bears, I have been and am currently involved in implementing the various research projects which responsibilities on coordinating the field research teams, collecting, managing and analyzing data etc. I am also coordinating with other partners, including mentoring scholarship students conducting bear-related research for Master on Biodiversity Conservation and government agencies to secure research permits and approvals. I am involved in wild bear distribution research in Cambodia and Vietnam, and now I am also working on a social research project to understand attitudes towards bears and bear part use in Cambodia which is the collaborative work between Free the Bears and San Diego Zoo Global (SDZG) aiming to reduce the demand for bears and bear parts – it is one of the main steps towards reducing the threats to wild bear population in the country. In addition, I am also assisting with ex-situ ecological and behavioural bear-related research in Phnom Tamao Wildlife Rescue Centre. I am very thankful to be a part of the Oxford Martin Programme on Illegal Wildlife Trade as Visiting Fellow. We have known the current status of bears is threatened by the huge demand within Cambodia and across the world especially for Asian traditional medicine which is still a barrier to the conservation success of these species. Cambodia is reported to have the highest bear seizures in the region. According to our current social research on attitudes and the demand of bear and bear part use, conducted across different geographic areas in Cambodia, it was suggested the next step needed was to reduce those demands. Through my fellowship, I hope to learn enough to feel confident to carry out a behaviour change campaign, from design, setup, through to evaluation. During this fellowship, I will work on next grant phase from a U.S. Fish & Wildlife Services project which is a collaboration between FTB/SDZG to implement and develop a theory of change to reduce the demand and change behaviour for bear parts in Cambodia. This opportunity will be an important platform to empower my work to improve the conservation of the rare Sun Bear (Helarctos malayanu) and endangered Asiatic black bear (Ursus thibetanus) in Cambodia. Wildlife conservation has always been my interest and has turned into passion since I completed my bachelor degree in Biology at University of Indonesia (UI), majoring Ecology. 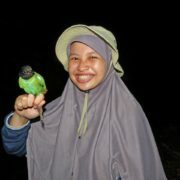 My previous research was focused on bird responses to encroachment effects (edge effects) along Bukit Barisan Selatan National Park, Lampung, Southern Sumatra, funded by Rufford Small Grants and Research Center for Climate Change UI (RCCC-UI). Currently, I am working at Wildlife Conservation Society Indonesia Program (WCS IP), one of the leading non-governmental organization, focused on conservation of wildlife and wild places in Indonesia. I joined WCS as Junior Researcher in Wildlife Policy Programme, early 2016. Since 2015, we have been working to support the Government of Indonesia to strengthen natural resources conservation policies, including revision of regulation and also improve the protected species list, by providing evidence-based researches. 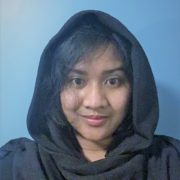 I am responsible in conducting research activities, supporting project management as well as maintaining communication and a network of partners and stakeholders, particularly in the Ministry of Environmental and Forestry and Indonesian Parliament. I am also involved in implementing one component of Bangun Indonesia Jaga Alam Demi Keberlanjutan (BIJAK) project, funded by USAID. This project focuses on strengthening policies, instruments and systems at a national-level to promote improved conservation area management and combat wildlife trafficking. One of the main activities is focused on reducing domestic demand of wildlife. I am an environmental enthusiast who sees himself as a well-known conservationist in days to come. Following my dreams, I am working to understand the problems in conservation of biological diversity and wildlife; and, implement them in grass-roots level. I am leading a local environmental non-profit organisation called “Greenhood Nepal” as a founder president for last 5 years working. Here, I work with youths and community people to curb the illegal wildlife trade of endangered species and few other environmental programs. I have worked for almost 7 years on community-based conservation, advocacy and campaigns. I have prepared and disseminated conservation awareness materials like hoarding boards, flex, infographics, documentaries, articles, etc. targeting the wide audience. And, in last few years, I am targeting to understand the drivers of illegal wildlife trade chain in Nepal so that it will be easier to implement innovative conservation ideas and break the chains. Currently, I am working on a research to understand people’s motivations to participate in the harvest, transportation and trade of wildlife parts in Nepal. In order to generate the ground understanding about the drivers of illegal wildlife trade, I have travelled across Nepal where I got the chance to interact with more than 110 illegal wildlife trade prisoners in different prisons. This study took almost a year and now I am working on my final outputs. Furthermore, I did my masters’ thesis on, “Assessing illegal wildlife trade in Nepal-China border region.” I presented my work in Beyond Enforcement: Communities, governance, incentives and sustainable use in combating wildlife crime symposium in February 2015 by SULi, IUCN and, attended some other conservation events around the world. I am very excited to be a part of the Oxford Martin Programme on the Illegal Wildlife Trade. I am applying social science to some really interesting conservation problems in Nepal i.e. interviewing IWT prisoners to understand their motivations to participate in IWT and collecting responses from the local community about the myths of price, demand and market of the wildlife parts. During my fellowship, I am focusing on learning methods to enhance my understanding of the supply side of the wildlife trade, including choice experiments and the Unmatched Count Technique. Additionally, I have collected some good quantitative and qualitative data during my community-based conservation work. I have also gathered data from my Rufford supported project entitled, “Monitoring illegal wildlife trade in Nepal-China border region.” I feel the necessity to learn more to make my work more efficient and impactful to tackle the complex problems of biodiversity conservation in Nepal. Through this fellowship, I’m looking forward to sharing my own experiences and research at the Wildlife Trade Symposium and other forums, whilst improving my skills in scientific writing and analysis. I will also be contributing to the development of the Programme’s Tools & Guidance, specifically with regards to analyzing seizure data. The academic environment and interactions with experts, academic colleagues, and potential donors will be a good addition for my conservation career. I was raised in part of the Republic Indonesia, which has the second largest biodiversity in the world. Since I was young, I’ve been interested on how to understand and manage mega diversity in Indonesia well. I completed my Bachelor Degree in Biology at Gadjah Mada University in 2013, undertaking several conservation activities including biodiversity surveys, campaigns and seminars. After I graduated, I joined a voluntary expedition called Ekspedisi NKRI Koridor Sulawesi, a joint program between Indonesian Army, Indonesian Scientific Authority, and several academic institutions in Indonesia. During my experience, I saw the real problem of how biodiversity is poorly understood and managed at the grassroots. Agriculture expansion on forests decreases environment quality, and impacts local communities who live near the forest. To maintain their livelihoods, some convert the forest into agriculture or hunt and sell wildlife. I imagine this happens in all areas in Indonesia and keeps me motivated to work in environmental conservation. Previously, I worked with Frankfurt Zoological Society as part of the Mobile Education Unit team for Sumatran Orangutan Reintroduction Program in Jambi, Indonesia. Now, I am involved on the illegal wildlife trade side as I am currently a Wildlife Trade Database and Analysis Officer of Wildlife Conservation Society- Indonesia Program (WCS-IP). In my roles with WCS-IP, I have been and am currently involved in various projects with responsibilities on building, coordinating, managing and analysing comprehensive illegal wildlife trade data. I also support intelligence analysis for WCS’s field teams in their close coordination work on illegal wildlife trade law enforcement with Government of Indonesia. I am very proud to be part of the Oxford Martin Programme on the Illegal Wildlife Trade as Visiting Fellow. As a home to more than 300,000 species, Indonesia has become a big source of the global wildlife trade chain. Indonesia is a major supplier for traditional Asian medicine in East and South Asia, and also a major supplier for pet trade across Asia, Middle East and Europe. Although Indonesia still has problems with weak sanctions for illegal wildlife trade enforcement, Indonesia is the leading country to implement successful cooperation between stakeholders to conduct law enforcement action. During my fellowship, I will learn about predicting the number of traders, and conduct a link analysis on illegal traders’ network, particularly on the shark and ray trade in Indonesia. This opportunity will be an important step to strengthen my analytical skills on illegal wildlife trade data, and ultimately to give better support to combat illegal wildlife trade in Indonesia. For further information about our fellowships or to express your interest, please contact Nafeesa Esmail.